Nick Jordan returns for the last time as one of the 3 Supermen. 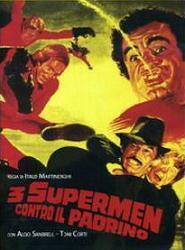 In this adventure the Supermen go back in time, via a time machine, to battle the evil deeds of the Godfather. Also stars C�neyt Arkin and Sal Borgese. (In Italian language and widescreen format).